Discussion in 'Sports & Training' started by killingmesoftly, Nov 30, 2017. Aldo or Holloway? Who's gonna be on top? UFC 218: Holloway vs. Aldo 2 sparks on December 2, 2017 at Little Caesars Arena in Detroit, Michigan. To watch the preliminary and main card online, you need a UFC Fight Pass. You can also tune in to Fox Sports 1 for the second set of preliminary card. Jose Aldo, obviously wants to be on top again but he needs to silence the raging Max Holloway at UFC 218. This is the first time Aldo will be on the challenger's corner in an UFC title fight. This is the rematch after Holloway TKOed him in the third round of UFC 212 main event. Alistair Overeem does not believe that Francis Ngannou is the hardest puncher in the world, after punching a machine that measures it. Ngannou will be the opponent of Overeem in UFC 218. “Fake news,” Overeem said. He would love to punch that machine as well and show who's the hardest puncher between the two - or I guess we need until December 2. 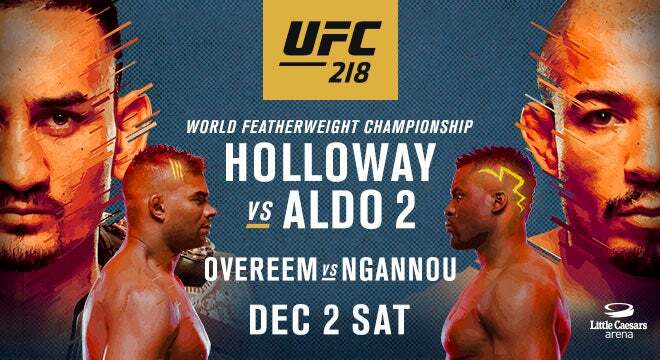 This is the UFC 218 Holloway vs Aldo 2 Live Online Updates, Predictions, and Results Stream. I will go with Aldo with a revengeful KO in the later rounds - if he is careful enough, Ngannou with a big punch, maybe Pettis wins against Cejudo, Justin Gaethje will have a big chance against Alvarez. Overall, exciting and explosive fights. Results will be posted later as updates. Who are your winners in this event? Max Holloway (c) vs. José Ald? Alistair Overeem vs. Francis Ngannou? Henry Cejudo vs. Sergio Pettis? Eddie Alvarez vs. Justin Gaethj? Tecia Torres vs. Michelle Waterson? I will definitely do. Thanks for inviting me.